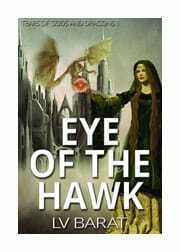 DTA Podcast: Guest LV Barat author of “The Eye of the Hawk” Available Now! Laura Barat’s first book of fiction is available now! 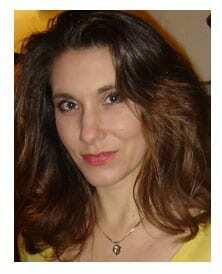 Laura has been on the DTA podcasts before as a Vedic astrologer and my co-host for various shows. We started out doing Laura’s radio show, Astrology Fundamentals, together (I was her co-host then), and along the line she decided to become a full-time author (she is a great Vedic astrologer, but she is not giving readings at this time). This is the 3rd interview in new series of podcasts on writers, their birth charts, and their books. Jaimini Vedic techniques show clear writing yogas and various other indications of writing in the birth chart, as well as the kind of writing, or most likely genre, an author will write in. The Moon is always involved in writing as it rules rhythm and the mind. The different types of writing depend on the planet that aspects or rules the Moon. Venus and Moon combinations are known for producing writers of science fantasy/dark gothic, epic fantasy, science fiction, poetry, prose, and certain types of non-fiction writing such as books on astrology. Jupiter and Moon combinations typically produce writers that are the helpers and wisdom teachers of the world, such as astrologers, coaches, therapists, scientists, and teachers, and Moon/Mercury combinations usually produces non-fiction or how-to writers. In Laura’s case, she has the Moon influenced by all three planets, Jupiter, Venus, and Mercury in either her main birth chart or her navamsa chart (the 9th divisional chart that is like a second birth chart it is so important in Vedic astrology). 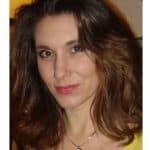 I remember learning a lot about astrology just from reading her content at her astrology website (Moon/Mercury), and now I’ve read her book of fiction, the Epic Fantasy novel, The Eye of the Hawk, and I can say that it definitely fits the Moon/Jupiter and Moon/Venus categories of writing too. Basically this means that Laura could write anything! One shapeshifter is worth a thousand armies. In an epoch long forgotten, a spell was cast around the island of Jaanaar, preventing its people from leaving and anyone from entering. One lone man, a foreign shape-shifter named Hawk, trained by Jaanaarian Druids, is sent beyond this spell through an elemental portal with coded instructions he barely remembers. To fulfill his destiny, Hawk must pass through a haunted forest filled with damned souls of the living and dead, where humans are crucified on trees. Accompanied by a Druid Healer who is eerily familiar, they are attacked by undead fiends and a ghost dragon who guards the forest. In the Crystal Palace of Corvasa, Sillisnae, an Adept’s Apprentice, longs to become an Adept and possibly the mistress of the King. But her wishes are thwarted when she discovers her tutor is a traitor and the Fire Globe, an ancient relic possessing the essence of elemental fire, has been stolen. Stimuli for the imagination can come from many sources, but in most cases, it comes from a place of questions and mysteries. Mysteries stimulate the mind but facts diminish it. LV Barat discovers tales in the most unlikely of places: in the ancient spiritual literature of India, Greece, Scandinavia, Britain and Ireland. An extensive study of the occult in several different cultures led to an awakening of the power of myth in her mind. Myths are woven in the imaginations or collective unconscious of peoples worldwide and the connection to the archetypes can weave tales that inspire! Jane Eyre was the first novel she read as a prepubescent. Its gray, mysterious moors and subdued emotions that raged under the surface of its characters called to her longingly, convincing something deep within her to become a writer. Laura’s writing process, her personal search for her ancestral roots, and her research into the spiritual literature and occult sciences of India, Greece, Scandinavia, Britain and Ireland. We also discuss some of the characters in the book, the second book in the series (it’s already written! ), and the third book in the series that she is in the process of writing now. We also discuss her birth chart and the writing yogas she has in it, and more. Filed Under: Podcast-Authors & Astrology, PODCASTS! DTA Podcast: The Art and Science of Vedic Astrology Volume 2 Available NOW!